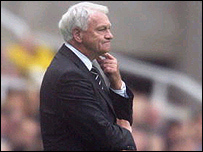 Newcastle deputy chairman Douglas Hall claims the club would have been relegated if Sir Bobby Robson remained in charge at St James Park. Robson parted company after five years, following a poor start to the season. Hall told the Sunday Mirror: "We had to get rid of him, he would have got us relegated, there's nothing more certain, we were going down. "It was a decision we didn't take lightly but we could see the team just weren't doing it for him." Hall claimed Newcastle's board was forced to act after a poor run of form. He said: "We took two points from a possible 12 and couldn't just stand back and watch Newcastle slide out of the Premiership." Robson's replacement Graeme Souness has still yet to win over the doubters on Tyneside. Hall said: "Graeme wasn't a universally popular choice, but chairman Freddy Shepherd and I knew he would sort out the dressing room and make sure we weren't relegated. "A lot of criticism he has had is unfair. Graeme was always going to need time to get the side playing to the system he wants."